I was searching online about my favorite vintage dealer, Didier Ludot, and stumbled upon this new video series by Hamish Bowles, world-class couture collector and Editor-at-Large at US Vogue Magazine. It features Hamish traveling the world and visiting many of the top collections and vendors of vintage haute couture and ready-to-wear, curated by a true connoisseur. The series includes a visit to Didier Ludot’s shop. The series is classy and worth a look. I always enjoy Hamish Bowles’ writing in Vogue. Didier Ludot’s tiny shop in the Palais Royal in Paris can only be described as a crammed museum of fashion, and if you’re lucky enough to charm him into having a look you can see some of the great works of 20th century haute couture. Across the courtyard, (former home of the author Colette, and a place with a checkered history that includes a number of duels) you’ll find Didier Ludot’s other shop, “La Petite Robe Noire” (The Little Black Dress) which sells vintage designer black dresses and his own line of clothing–a modern takes on vintage cocktail numbers. When you see stars on the red carpet coyly saying they’re wearing vintage “from Paris”, it’s probably from his shop. Part of my story is that, as the wife of the lawyer for a number of big show-biz events, a couple of times a year I need to don a gown with a capital “G”. Shopping that should be fun is actually a pain, because modern eveningwear is expensive and awful. Late 50s Jean Patou Dress designed by Karl Lagerfeld. It was on a Barbie-waist-size mannequin, which coincidentally is not my size. When we looked in the shop, Didier, clad in what appeared to be Louis the 16th’s striped pajama bottoms and dancing slippers, was negotiating with a couple of Japanese guys over a 60s Hermes Kelly bag. My protests about the dress not fitting and being mortified went unbidden. My husband shoved me in the shop, charmed Didier, and before you knew it, I was being shoveled into the hidden interior mesh and boned corset onto which the dress is loosely tacked. The dress itself was made of a heavily-woven iridescent aubergine silk, lined with silk organza, and it was so stiff it could almost stand by itself. The label was Jean Patou, which at that time was designed by Karl Lagerfeld, just starting his career. Inside the streamlined exterior of the dress was miles of hand-sewing and more engineering than the Golden Gate. To get the corset closed, I would exhale forcefully, then have my husband do up the band of hooks and eyes on the back. After that he would zip up the zipper on the dress over the corset, and from then on I would not draw another full breath until the dress was off again. I wore that dress to at least 10 events, because, unlike the very American concept of being cool by wearing “something new”, a dress that distinctive can be worn repeatedly, in the more European concept of something being a signature of your taste. 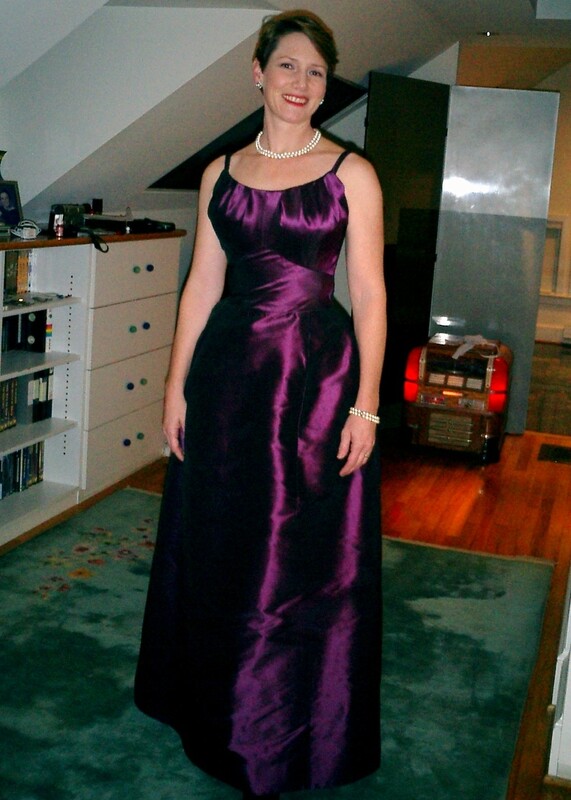 The corset gave me a wasp-waist, wonderful posture, and then incredible internal distress as soon as I would eat something at dinner after the event. The last time I wore it, my son was three months old, and upon returning home to a squalling, hungry child and a dress that required ten minutes and a lady’s maid to remove, I hung it up for good. Oh, how I wish I had taken a picture of the interior before I sold it! Since then, I’ve always made a point to peer in the vitrine of Didier’s shop while walking through the Palais Royal on the way to Juveniles, and once in awhile, I go in and pick something up. I’ve seen that my blog has had visitors from Saudi Arabia, South Africa, the Netherlands and other points in Europe, New Zealand, Australia, India, Asia, US, Canada… Thank you for stopping by! Do you have a favorite “vintage” shopping place in your area? Please leave a comment; I’d love to hear about it.